Now time to listen relaxing royalty free music! Relaxing spring music, Spring Optimism, is an instrumental guitar electronic track with best combination of melodies and harmonies. Let the spring begin! Demo Discussion behind the game, how it was made. Ah ok! ;) Then no problem. The game you made is interesting BTW. Good use of those resources! Shouldn't you credit this guy on this page who made the resources you use? All characters, tilesets and pictures you use are made by this artist. 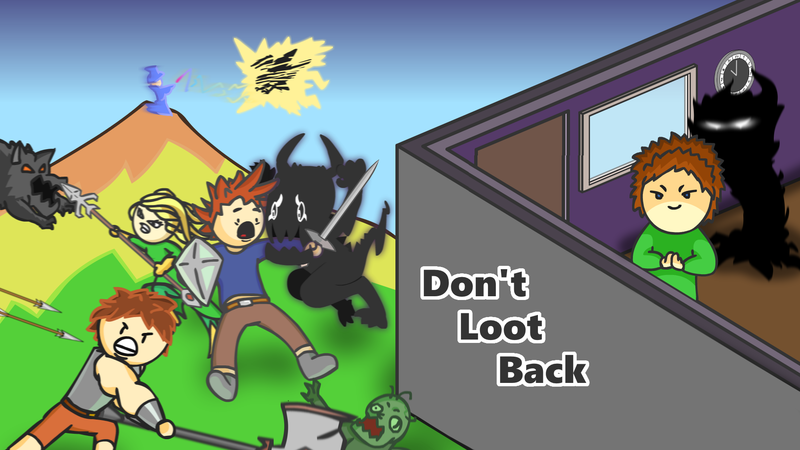 Soundtrack for Don't Loot Back Demo is released! Wonder what happens to those NPC's that are looted by hero parties? Wonder no longer! Life is not easy for an NPC minding his own quiet family life. In a moment´s notice, raiding party of heroes can barge into your home, pilfer and purloin your life-long savings and children´s college-funds. Not even the most remote locales are safe from their indifferent wantonness and craven ways. I will be posting all new updates, concept discussions videos and game information in here. Feel free to share your thoughts and feedback on the game. Thank you for the broad well-rounded feedback and testing the game out! Hi Veteran Newb, thank you for taking a look of this! This project gave me a lot of insight how to make rpg maker plugin to do completely different things that it is originally planned for. Whatever happens, I will be releasing this in some way or form. SCP-049 Plague Doctor song with scary halloween atmosphere! Inspired by world of SCP Foundation and games like SCP Containment Breach. As halloween draws near, I present you a SCP Containment Breach , fitting survival horror music we made in one of the previous composing streams on this channel. Its a creepy halloween song for Plague Doctor, SCP 049. This characters is familiar face from medieval times to current day and age. Plague Doctors used to spread plague all around and thus they were feared. SCP 049 is no different. You bet dark omnious music starts playing when he is around! Dark ambience music makes you terrified of this SCP monster! To The New Land is inspired by American explorers like Christopher Columbus, who ventured far over the ocean to find their new home. This beautiful journey would change the course of the world forever! First it starts small, but later grows into an epic tune! Old and new world combines and exploration music brings hope and inspires imagination. This track could be in world of Dungeons and Dragons, RPG adventure or even in real world! Cool work pat! You work in any projects at the moment? Cannot really help in that. The problem is that there are just too many games like that. Do you remember anything else? I can relate. Finding old games, especially indie games is truly hard. There is a "credits" box, copy that to your game or media and you can now use the song for free. Tadaa! You are ready to use the Royalty Free Music File! It is that simple! Fully Free Album, check it out! Put this to game credits, video descriptions or to somewhere in your product where you use the music. Look at descriptions of each song and put my name at credits accordingly. FREE Creative Commons license only applies for works properly credited! itch.io Community » itch.io » Questions, Ideas & Feedback · Created a new topic Any tips to get into Itch.io community? Could someone more experienced or into the community give a tip from where to start? I am a composer who is having video game making as a hobby. I have checked out Game Jams and those seem to be an interesting way for people to get together and make games. But is there some sort of special way for Itch.io how newcommers begin here?